I wanted to share a special link with you today to a church service I participated in earlier this month. I know it will be a blessing! On March 3rd, I was invited by Central Presbyterian Church in Summit to read LOVE IS KIND (Zonderkidz, 2018) for the children’s message at their Sunday evening contemporary Wave Service. I was asked because my dear friend, Pastor Noelle Kirchner, was preaching a special sermon where she shared her moving testimony of her grandmother’s miraculous healing from cancer and the beautiful role that played in Noelle’s faith journey. As a prelude to her sermon, she asked me if I’d share LOVE IS KIND with the children, and by extension with all the adults, too, who were seated coffee house style on sofas and at cafe tables all around the room. She asked me because in addition to being a story about spreading love and kindness, LOVE IS KIND also celebrates the special bond between grandparent and child. Indeed, just as Noelle’s relationship with her grandmother shaped her faith journey, Little Owl’s special relationship with his grammy helped him to see his day through new eyes. Congratulations! I will be in touch with you today so we can get the book to you. Thanks again, Mindy, for an illuminating interview. I’d also like to thank Zonderkidz for providing the winning copy. Happy Friday, all! Here are a few pictures that capture both the prep work and the event itself. (I just wish I’d taken a picture of the kids making their masks which were so colorful and CUTE!) It’s a SLIDE show! (I just discovered this feature.) Enjoy! 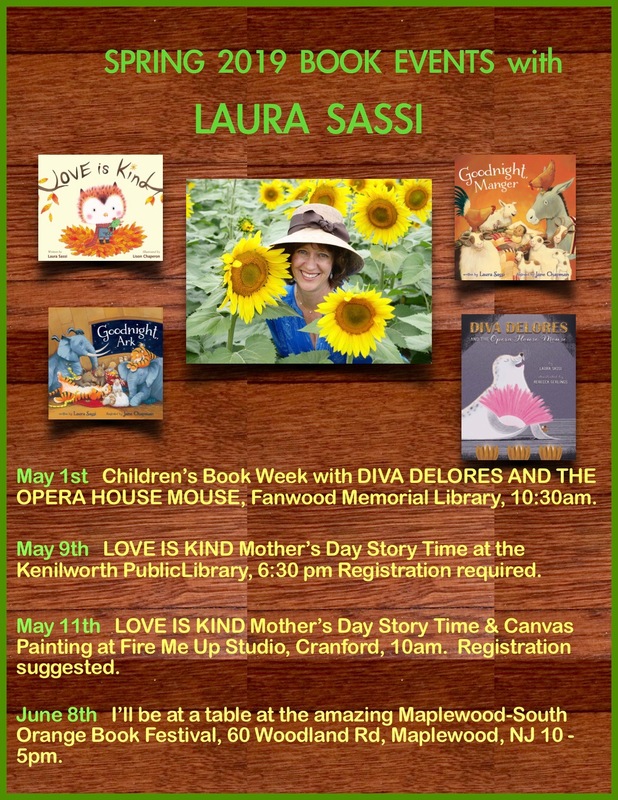 CRANFORD – On Friday, May 4th, my mother, picture book author Laura Sassi, came to Bloomingdale Avenue School to share her new book, Diva Delores and the Opera House Mouse with kindergarteners through second graders. The purpose of her visit was to get kids excited about reading and writing and to share a little bit about how a picture book goes from inspiration to publication. Starting at 1:00 pm, three different groups came to the auditorium for this special event. The students quietly listened to their teachers and all had smiles on their faces. The kids looked very excited and happy to see that a special guest had come to visit them at their school. Dressed like a diva herself, and using lots of expression, even singing, Laura Sassi read her newest book. The kids “ooohed” and “aaahed” as if they were watching fireworks. After reading Diva Delores and the Opera House Mouse, the author showed the students the very first drafts of her story. She even showed the kids pictures of what Diva Delores looked like before she was a seal. The kids were surprised that she was once a hippo! I was lucky enough to get student feedback as well! Second grader, Taylor, explained that her favorite part of the visit was when the author “dressed up fancy and was reading Diva Delores”. She added that the visit also inspired her to make a writing notebook for her own stories. It was amazing being able to see my author mom in action reading her book. I could tell that the teachers and all the students enjoyed the visit. My mom enjoyed it too, especially when one of the students raised her hand and said, “You look like a movie star!” But my favorite moment was when I was able to reunite with all my teachers from kindergarten through second grade. I was so happy to be able to see my teachers and I was so happy to see so many kids enjoying and listening to the book.